The classic Edwardian exterior is a delightful juxtaposition to the expansive, contemporary interior of this unique 5-bedroom, 3.5-bathroom home. Some of the finest designer finishes were implemented during its 2010 renovation. This included a full systems upgradeto3 zone high efficiency furnace, tank-less hot water heater and 33 Sunpower Solar panel energy system for the ultimate in sustainable comfort. 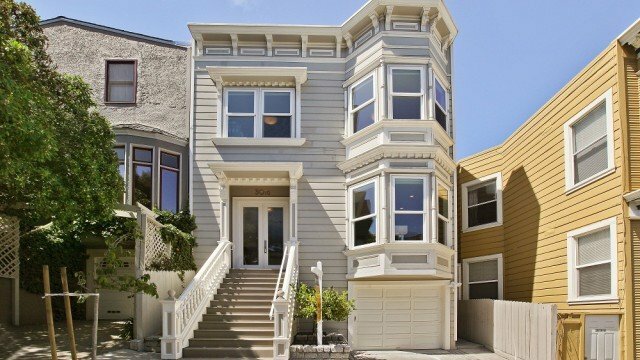 This home is detached on 3 sides, flooded with natural light and located in one of San Francisco’s most vibrant and accessible neighborhoods, within walking distance to the JCC, Laurel Village,Fillmore Street shops, the city’s best private schools and the Presidio. Upon entry,your eye will be drawn to the openness and warmth of the main living level with its dark-stained white-oak floors, floating walls and 11 -foot ceilings. There is a custom red elm feature wall that provides dramatic, organic continuity to an open living, dining, built in work areas and a gourmet kitchen. Designed for an art collection, its clean lines and an elegant powder room are rivaled by immense built-in storage. State of the art appliances and modern fireplace make this home a showcase for easy entertaining. The chef’s kitchen was designed for cooking and with special amenities abound including a built-inMiele coffee center, appliance garage and heated porcelain tile floors. Direct access to thelandscaped garden with prolific lemon trees, deck and gas grill makes all the difference in the everyday, comfortable enjoyment of one’s home. The spacious master suite is a retreat with a picture window view of the San Francisco skyline and a private, walk-out deck. It features a custom-designed walk-in closet and a luxurious bath with steam shower and heated floors. Two other large bedrooms with tall ceilings and sunny, south-facing windows;the laundry facilities and an additional full bath complete this level. This top floor family room is a great space for informal gathering, a media room or an office. It features a large deck and fantastic view of the city. Architectural drawings for adding a mini bar or kitchen and plumbing are available. This level features two additional, comfortable bedrooms, a full bath with custom double vanity, wine cellarfor up to 1,200 bottles, and expansive storage. It also provides interior access to the two large car garage.